June 11-20, 2018: We’ll start in Queenstown at 1pm on June 11, and wrap up in Queenstown no later than mid-morning on June 20. Transportation is included throughout the workshop. We'll be using a driver and very comfortable 16-passenger Mercedes van with ample storage. Airfare and transportation to and from the airport are not included, but an airport Super Shuttle is recommended. 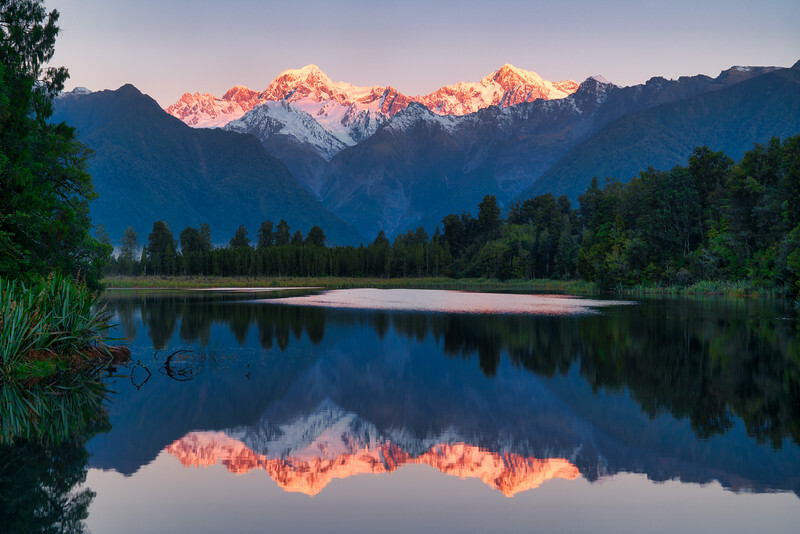 Private lodging (each participant has their own room) is provided for each of the workshop's nine nights: our first and last night in Queenstown, one night in Wanaka, and two nights in Te Anau, Fox Glacier, and Twizel. These are very comfortable hotels that we're sure you'll enjoy. No one will be assigned a roommate, but if you wish to share a room with a participating friend or loved one, a discount will apply. Breakfast and lunch are provided each day. Our early sunsets will allow you to explore dinner options in that night’s town, either on your own or with other members of the group. We have two very special tours planned: An all-day cruise on the must-be-seen-to-be-believed Doubtful Sound through Fiordland National Park; and a helicopter ride above and onto Fox Glacier, where we’ll land and be guided to spectacular glacier views beneath Mount Cook and Mount Tasman. Night photography is planned for at least one night, conditions permitting. Price: $9700.00 - Includes: 9 nights private lodging, all breakfasts and lunches, workshop transportation, all-day Doubtful Sound boat tour through Fiordlands National Park, 4-hour helicopter tour with photography on Fox Glacier. To register: A $1000 non refundable deposit will hold your space. Due to the significant upfront expense and commitment this workshop requires, this deposit is not refundable (though some adjustment may be possible after the workshop). Mail your check to Gary Hart Photography, 2121 Natomas Crossing, Suite 200-198, Sacramento, 95834 If you notify us that your check's in the mail, we'll hold your space until it arrives. You can also pay the full amount with a credit card by clicking the PayPal link below. Enjoy A Ride Up And Down Fox Glacier - Included In The Workshop With 2+ Hour Shoot Session On The Glacier! Expereince Ice Caves, Cravasses, Waterfalls And More. This Is An Experience Of A Lifetime! Instructors: Gary Hart and Don Smith have nearly 80 years combined photography experience. They have each been guiding 15-20 photo workshops per year for over ten years. FAQ's: Please CLICK HERE to read FAQ's.